PlatinumGames has surprised us with yet another Switch exclusive! 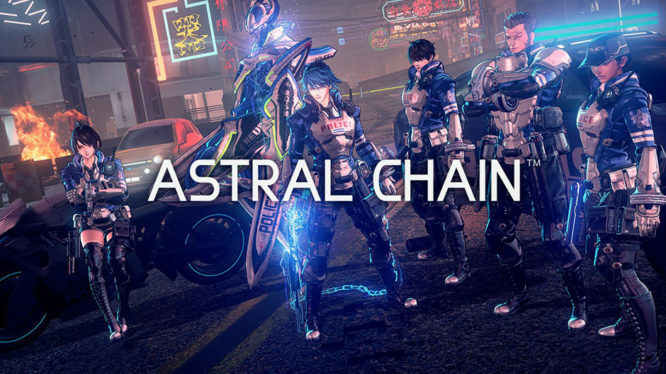 Astral Chain, a brand new action IP from PlatinumGames, is coming exclusively to Nintendo Switch on August 30, 2019. Taking place in a sci-fi future, the world is thrust into chaos as dimensional gates begin to form. When aliens start pouring out of these gates seeking destruction, a special task force called Neuron is created to combat them. Starring a twin cop-duo, you will have the choice of either playing as a male or female character with the other still fighting by your side as a member of Neuron. With the help of Legion, a powerful ally invented to help defeat the alien threat, you will never have to fight alone. Whether you want to focus on the same enemy, split up, or send Legion to fight while you provide backup support, the varied style of combat is always your choice. When you aren’t fighting the alien-like creatures, Legion will accompany while you explore the city of Ark and investigate the mystery of the extraterrestrial invasion. Takahisa Taura (game designer on Nier: Automata) will be making his directorial debut, and will be assisted by Hideki Kamiya (creator of the Bayonetta series and director of The Wonderful 101) acting as in leading supervisor role. You won’t need to wait long to get your hands on Platinum’s next game because Astral Chain releases on August 30, 2019 as a Nintendo Switch exclusive. Check out the game’s debut trailer below.